Two months after operating actively for one year, Forgemaster Lilith announced her intention to close down the company on galactic scale. The ever expanding Gearworks community and employees were taken by surprise but supportive of her decision. [click here for the full story]. Dark Skies Gearworks began its operations exactly a year ago. Forgemaster Lilith Kaine-Natanaele released a short announcement to the public. [click here for the full story]. As a member of the Trade Federation's Department of Trade, Gearworks is happy to announce its opening. Please visit the DoT holonet for more information, sales and stock details. 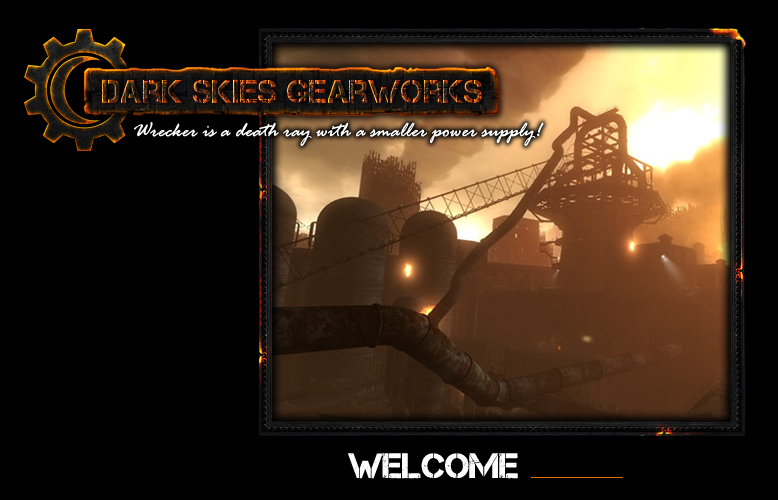 We are happy to announce the newest addition to the Gearworks community, Dirty Collar Industries. [click here for the full story]. Dark Skies Gearworks is happy to announce being official sponspor of Krieg's Run Third Season. [click here for the full story]. This day Trade Federation and Dark Skies Gearworks entered an official partnership. [click here for the full story]. As of Day 341 company’s ownership was fully transferred to Forgemaster Lilith Delcroix. [click here for the full story]. After lots of hard work and help we have managed to improve the DSG website. You can enjoy some new backgrounds, our new font and new expanding menu with new pages. Members can view the full Anouncement on the forum. Nova Industries in cooperation with Dark Skies Gearworks brought us a report about their alien miner. [click here for the full story]. Welcome to Vorsia News Network. Today’s top story is about a pilot that went missing during tragic prototype testing...[click here for the full story]. I am pleased to announce that the forum is up and ready for use. Click on the FORUM link above to access it. Y13 D185 - FACTION CREATED! I would like to thank Lord Mustafa, Crow Kain, Cael Graigan, Han Kannis, Phyllis Skittles, Ithael Slite, John Paendrag, Viridian Vox, Viki Riki, Stonewall Lee and Veritas Press for their time and helping to found the faction. As of Y13 D184 2:52:11 (CGT) Dark Skies Gearworks holosite is online and in accordance with galactic business regulations.